With the holiday season right around the corner, the weather finally starting to feel like autumn (in the northern hemisphere anyway), and as a way to cope with everything going on in the world, I needed to take comfort with my oil paints. I equate using oil paint with eating comfort food in my mind anyway. Compared to painting with watercolor and acrylic, oils provide the oozy, rich warmness you get from eating mac 'n cheese, lasagna, cheesy mashed potatoes and the like. At least I think so. I can't think of anything better than mixing up a palette of all values and colors of oils. Then you apply it via brush or palette knife for the cozy satisfaction of rendering a painting well painted. Take comfort in your oil paint. Before the month was completely gone, I wanted to post again. I've had a slow week or two getting going with my painting. I don't know why, but suspect it's painting ennui, that is, boredom and lethargy. The only way I know how to break the cycle is to paint and paint some more. So that's what I did this week. I also decided to use a different medium than what I've been using of late. I switched to water-soluble oils rather than my usual acrylics. That did help since you use them differently, not altogether differently but enough to make it more interesting. The ennui was overcome, at least for now. I decided to paint a little impressionistic landscape before the seasons changed completely. Hope you like it. Painters should not be bored. One thing I like about seascapes and beach/water scenes is that there is an unlimited number of combinations between the color of the sky and the color of the water. There are a myriad of reasons, such as the time of day, the weather, the season, the geographic location, and the surrounding landscape, if any. What attracted me to today's image was the contrast between the predominantly ultramarine blue of the sky and the cerulean/pthalo green of the water near the coast. Beautiful, and it also helps set the mood, bright and sunny, a winning combination. 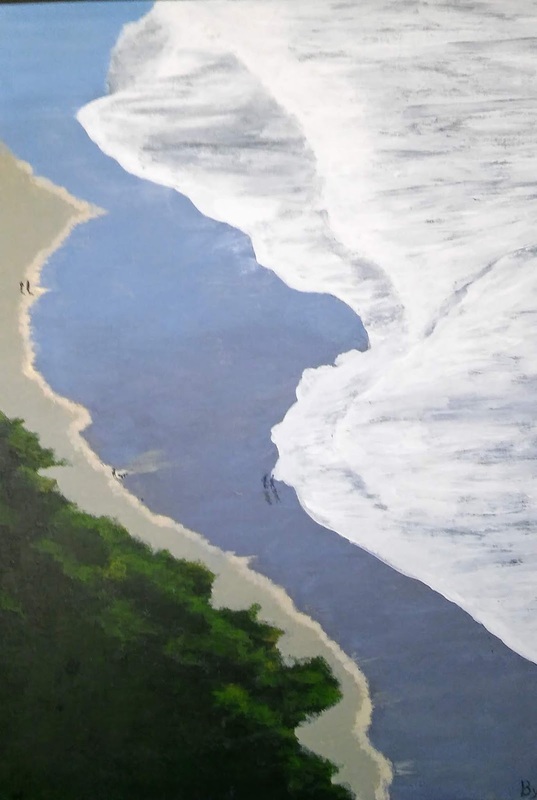 Beach scenes also keep the painter on his toes by having to create the correct color of the sand at the location of the painting. Similar to the reasons mentioned above, the types and colors of sand around the world are almost limitless. 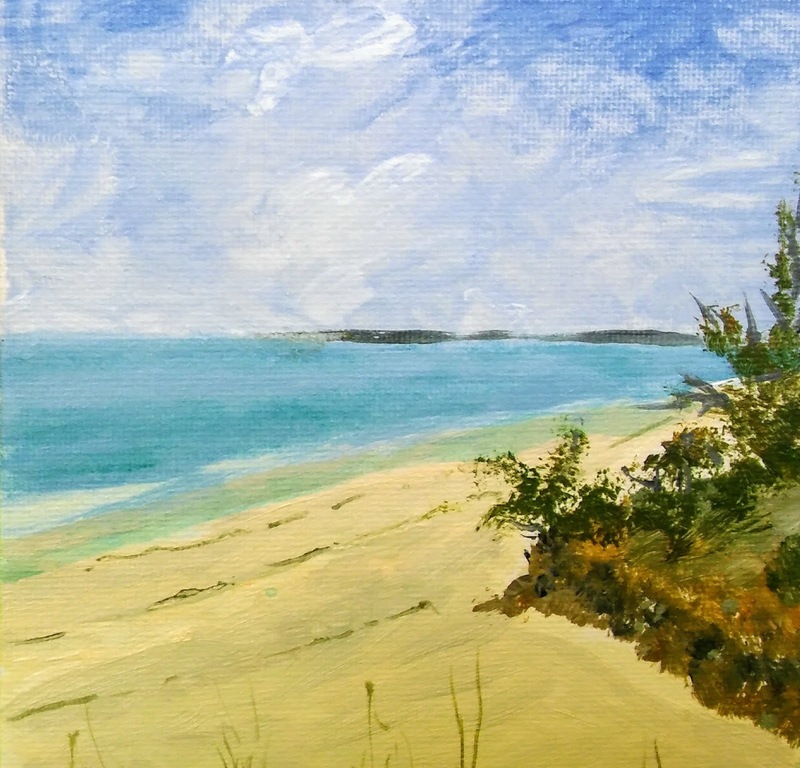 The sand in today's painting was mixed with primarily titanium white, but you have to add very small amounts of cad yellow light and and cad red light, along with a dab of ultramarine blue to help gray down the other three colors slightly. I always forget that until I notice that something with the sand is not quite right. I hope you like it and that you will paint your share of beach/water scenes. As summer turns into autumn, I wanted to paint a landscape that celebrates the changing seasons. This after not posting in September while I was figuring out what to paint next and where to take my painting. This time for reflection has happened before, and I'm sure it will happen again. I feel sure it happens to most painters at some time. Neither a slump nor a retreat, it feels more like reaching a plateau, and now it's time to take stock and move on. 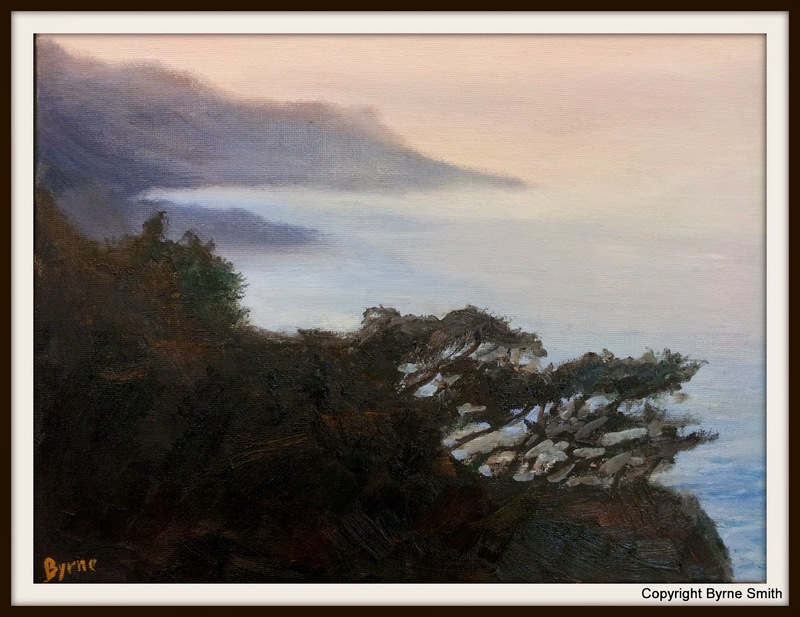 I now feel clear-headed about continuing on my path of painting acrylic landscapes and seascapes. although I may try painting on larger supports soon. I hope you take some time to reflect on your work now and then. I spent the week painting this rather non-traditional landscape (or maybe it's really a seascape). I say non-traditional because of the perspective and viewpoint, almost overhead the beach below. Most landscapes are typically a straight-on view with the horizon line positioned somewhere with the sky above and the usual fore-, middle, and background view of the land. In my painting there is no visible horizon line, and the viewer is looking down at waves, shallow lapping water, the beach, and vegetation at a steep angle. That's probably what drew me to paint this scene. Even though it's highly realistic, it's also somewhat abstract when you step back a bit. Also, don't miss the five figures and a dog walking along the shore. They don't jump out at you because of their small size, but do provide scale, which is very important for this motif. 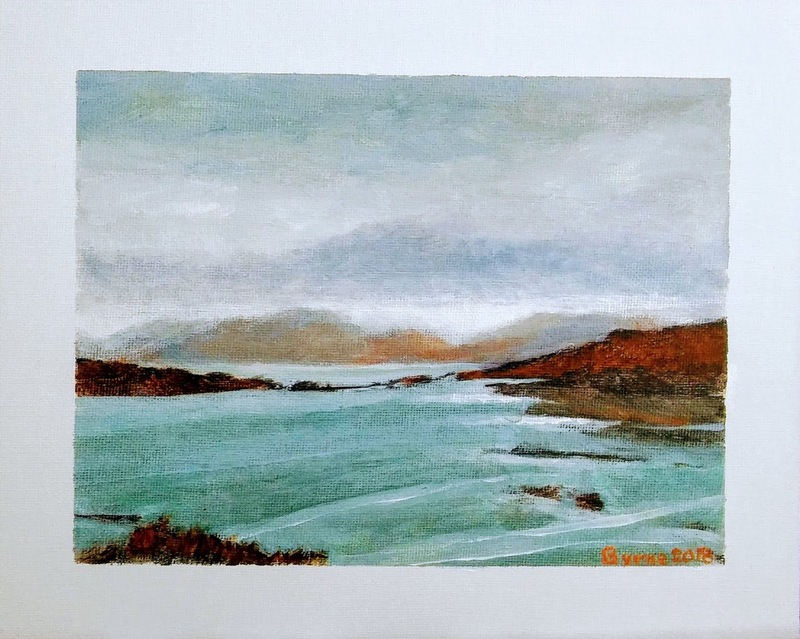 I understand it's good for viewers and collectors to be able to look at a painting and almost immediately recognize who the artist is by his or her style and subject matter. But it's also good to try new things and new ways now and then. 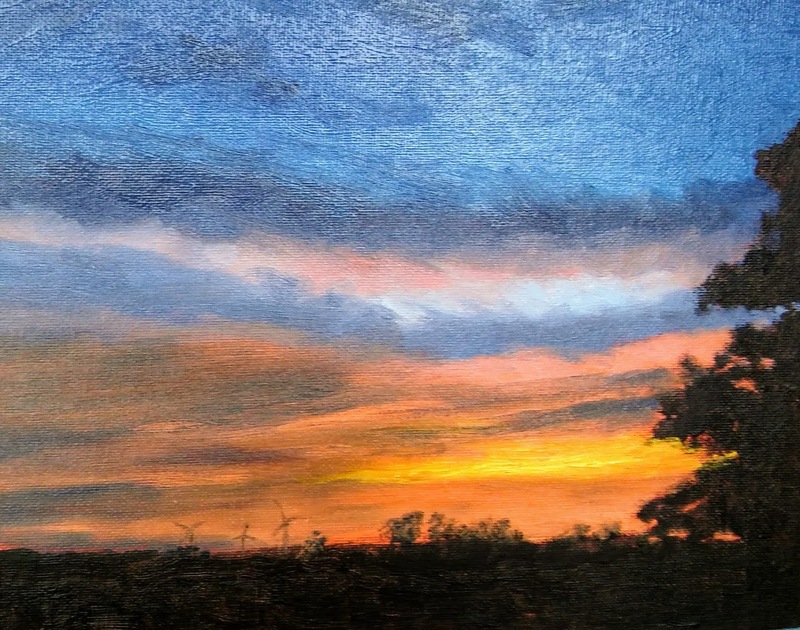 It will certainly give you a new perspective and may just get you out of a painting rut. If any month deserves a calming landscape, it's August (and possibly December also). The heat, the glaring sun, the heat, the dash from car to building, the heat, the sunscreen, the glowing perspiration, the heat, the must-go-now holiday/vacation. Did I mention the heat? Today's image is the one I mentioned in the previous blog--the one I let rest for a while. As I suspected, I did make a couple of changes that I thought would help. 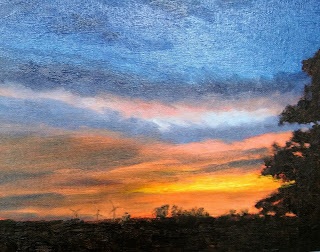 The main thing I did was to tone down the setting sun so that it was less intense to match the time of day, which was dusk. I also lowered the intensity, slightly, of the orange glow around it for the same reason. I added a few darks to the immediate foreground for depth and, of course, signed it. In paintings like this, I find acrylic to be most beautiful with the ability to blend and blur just the right places. I hope the painting ushers in a calming August for you, too. Last week I worked several days on a landscape. I decided to let it rest for several days before I view it so that I will see it with fresh eyes and hopefully make a few changes, if necessary, to improve it. I recommend this approach for all paintings. Step away. But while I was waiting I still had to paint. You know how that is. 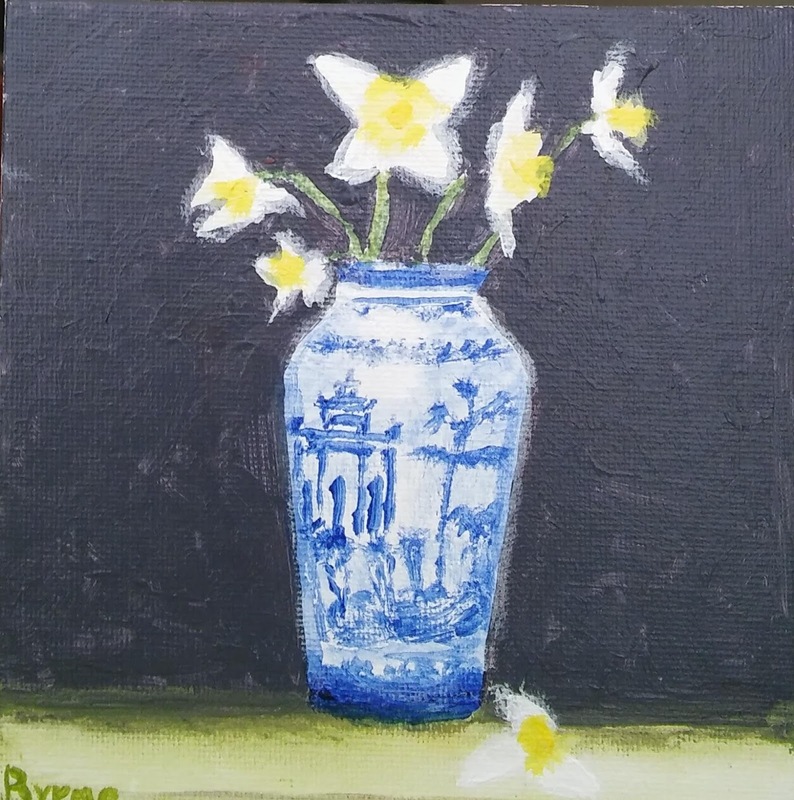 I decided to paint a small floral. I started painting small florals, which was a new motif for me, earlier this year. The florals I paint all seem to have decidedly dark backgrounds. The ones I admire from other painters also seem to have dramatic lighting, which I'm still working on. Today I want to talk about luminosity. I thought I knew what luminosity in painting was, light surrounded by dark, but I wanted a better artistic definition. 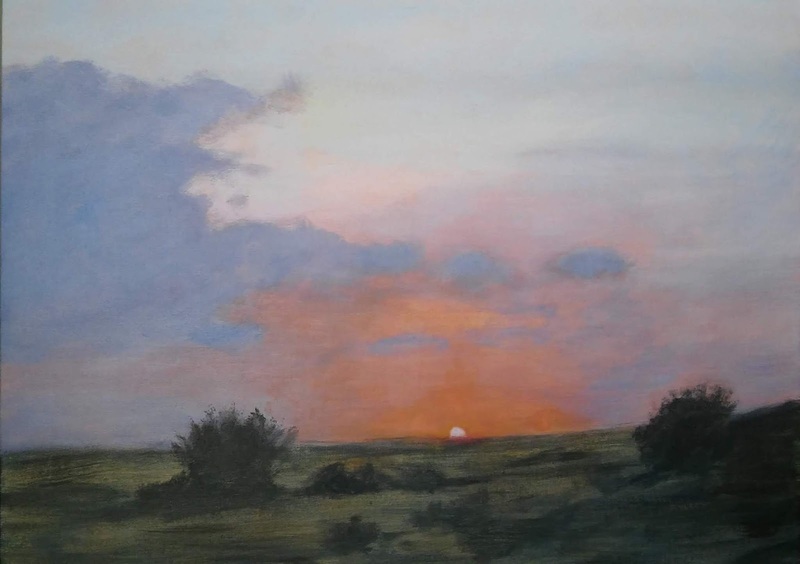 This one came up first when I Googled luminosity defined: the glow or brightness in a piece of artwork; refers to the created light which can vary in gradation, and other ways (i.e. reflection and/or amount of diffraction or intensity). Yikes. I like my definition better. Be that as it may, I tried to create luminosity in my floral with the lightness of the vase against the very dark background. My intent was to make the vase appear to glow in the ambient light, which I think I did. Also, another fun fact I discovered while painting this--another way to make green. The background color I used was Payne's Gray, a bluish black. When I painted a very thinned down Cad Yellow Medium for the stems, I got a subtle translucent green, not to detract from the bold yellow flowers. With summer now in full swing, I thought I would celebrate the season with a painting. 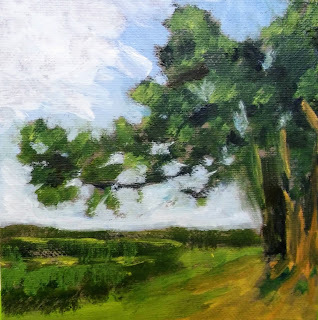 If you are a regular reader of The Painting Life blog, then you know I have recently been painting panoramic landscapes, that is, landscapes with an aspect ratio of at least 2:1, sometimes more. 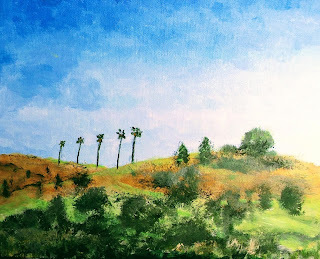 I usually paint in relatively fluid acrylic on Arches watercolor paper trimmed to fit the horizontal layout of the panorama. This time I decided to paint acrylic on a canvas panel instead, painting with the acrylic in the more conventional way. I really liked this landscape with the road on the left leading toward the distant mountains. I hope you like it, too, and that you're having a great summer. Well, the daffodils quit blooming a few months ago. The summer heat is about to cause a lot of other plants and shrubs in the backyard--roses, coreopsis, African daisies, day lilies, and some varieties of lantana--to stop blooming and go into survival mode as July and August approach. For now, the firecrackers, roses of Sharon, and hibiscus seem to be taking it in stride. This not being a gardening blog, I'll explain. 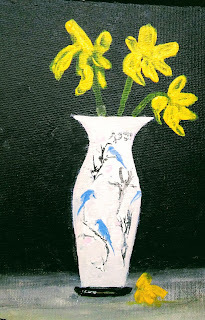 When the daffodils were blooming, they were quite striking, and so I wanted to paint them. I also firmly believe summer is the time to do different things, and that goes for painters, too. It's a time to unwind and re-charge. If you follow The Painting Life, then you know I rarely paint flowers or still lifes for that matter. Summer should relax and re-charge you. That's what painting daffodils did for me. I hope you like it, and I hope you're doing some relaxing and re-charging yourself. It's been a couple of weeks since I last posted. I was busy working on a few paintings and also cleaning out my collection of old art magazines, columns, articles, reference photos, etc., etc. They had stacked up and become almost useless as I didn't know what was in any of those stacks. Anyway, the palette was basically warm and cool primaries with a couple of earth tones plus cad orange, pthalo green and white, of course. Previously, I didn't include cad orange as I felt it superfluous since I could mix cad red light and cad yellow light. I had sparingly used pthalo green, as we all should; however, more recently, every time I used even the slightest amount, it overpowered whatever color(s) I mixed with it. So, I decided to banish pthalo green and just go with the cerulean blue, which was the warm blue already on the palette (it has a green tint anyway). And I added cad orange. Also, I am attempting to mix more of the colors on the canvas itself rather than the palette. This, as you know, was the method used by the Impressionists, but it's not as easy as their paintings make it look. Daubs of color next to each other sounds easy, but it's not-- just one more thing to master in the painting life. The result is today's image--an attempt to paint a cool motif to make me think I'm cooler on a hot summer's day. Hope you like it.